The entries are pouring in for this month's 1 Hour Design Challenge: Business Card Hacks, where designers and makers are invited to create ingenious items out of ordinary business cards. The concept above, "Seed Card," is a twice-ingenious design. The business card is part seed paper, part paper. 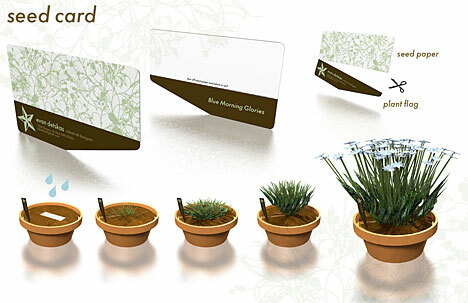 You tear off the seed paper part and plant it in some soil, then use the remaining portion of the card as a plant flag with the card holder's info on one side and the flower type on the back. Says designer Greenman, "We typically use flowers to think of, or remind others of us, so I thought it was appropriate." Nice. View all the 1 Hour Design Challenge Business Card Hacks right here, and upload your own. The 5 top designs will win 1000 free business cards from our sponsor, UPrinting.com. hate to nip your idea in the bud, but this is about as original as the flexible retractable screen on digital devices that students always design. The business card as seed packet has been done many times, including by Luca Casini, who designed and made a postcard exactly like this...in the mid 90's. Nice visuals, however!